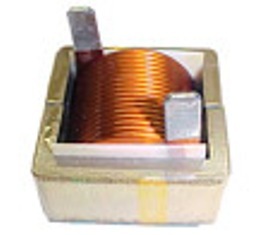 - The common mode inductors provide a high level of attentuation of common mode currents. These inductors and output chokes are for filtering noise in dc/dc converters. Cores used are: Micrometals iron powder #26 cores for differential mode chokes, and Magnetic Inc's high permeability manganese zinc ferrite cores with same specs and size. Please call to check availability. Usually many standard products are in stock but there are items that we do not stock. Delivery time could be up to 4 weeks. The differential mode inductors may be used to reduce the differential output noise by approximately 20 dB.The common mode inductors provide a high level of attentuation of common mode currents. our sales for your special requirements. DC Inductor, AC Inductor, DC+AC Inductor, etc. 2) Larger OEM quantities are manufactured at our off shore facilities in Asia. If you have high volume requirements, it is still cheaper to obtain them from us. We will meet or beat any competitors pricing, with better delivery. 3) The data shown below can be sorted by Part Number, Inductance, Rated Current, DCR, or any of the header columns. To sort, please click on the column headings ( first row ).